We are no longer stocking leatherwear but have a few small and large sizes left. Please call for more information. We only charge Postage & Packing once so if you have to send something back to change the size you will not have to pay again. We know how much you’ll appreciate the quality of our leatherwear but to make sure you have No Risk when buying our products, and are completely satisfied with your purchase, we offer you a 100% No Risk Money Back Guarantee. (This is in addition to your statutory rights). Please see below our size change instructions for returning an item for exchange or refund. If you need to change an item for another size please return it to us (in its original condition) by recorded insured post and we will replace it with the alternative size of your choice postage & packing free or refund the full value of the product. We are a family business run by Richard & Happy Starkie. 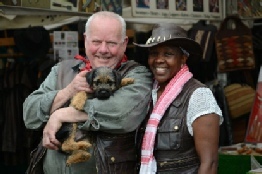 Richard & Happy seen here at one of their shows with “Khaki” their Border Terrier puppy. (He’s the third Khaki Starkie! The first two are Zebutu & Ben their children. Note the brown Land Rover which Richard says he bought to match the family!